The society has five telescopes and one pair of binoculars (as listed below) for hire, on a monthly basis, all with eyepieces, finders and mounts. We hire these telescopes out to fully paid up members of the society only. Telescopes 2, 3, 4, 5 and 6 are ideal for beginners and newcomers to astronomy, whilst telescopes 1 and 7 are for slightly more advanced observers and those wishing to maybe have a go at astrophotography. All these telescopes will give you the chance to see for yourselves the wonders of the night sky, and many hours of fun can be had by hunting down the elusive objects that you have seen many times in books, and wondered about what they would look like through a telescope. There is no greater feeling in astronomy than when you find that object for the first time and see it with your own eyes. So don’t delay, hire that scope today!! Please note: Telescopes 1 and 4 come on a German equatorial mount with motor drive to the right ascension axis. 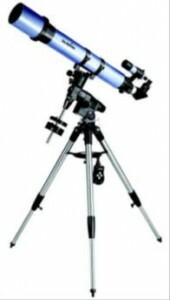 The telescope and mount are fairly heavy items and therefore we can only hire to persons who are capable of handling the equipment and have had some experience of using such equipment. Training on the mount and telescope must be obtained prior to using them (see Bob). Please do not let this put you off as these telescopes have a lot of advantages over the others, as they track the night sky giving you freedom to enjoy the view for longer and maybe try your hand at drawing or astrophotography. All telescopes and binoculars are the sole property of the society (LDAS) and are for hire only. The hiring charge is not negotiable and must be paid in advance for a minimum of one calendar month. Equipment can only be hired for a maximum of two months at any one time, this is to be fair and give other members a chance to hire. Longer hire durations can be arranged, just ask Bob. All equipment hired is to be picked up and returned to LDAS at the observatory at Standalone Farm or at the monthly society meetings, please arrange with Bob. All members must fill in the hiring form prior to hiring the equipment; this is for our records and security. Please do not touch any of the lenses or mirrors with your fingers; they have a very special coating which can easily be damaged by touch. Please do not attempt to clean the lenses or mirrors yourselves, if they require cleaning please report back to Bob. Please treat the equipment with respect, all astronomical equipment is very expensive, and care should be taken when using not to drop or damage the equipment in any way. Please familiarise yourselves with the equipment prior to hiring, although training on the equipment will be given at the time of hiring, please do not be afraid to ask for any help should you need it.